Leary’s goal is to give operators a tool to enable them to decrease make-ready time and improve quality and efficiencies. 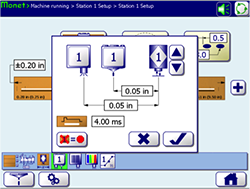 Our Array and MAQ controllers, with cutting edge gluing and inspection technology, are paired with Monet software, an interface that is so simple to use that it delivers an immediate cost savings. MONET operating software has been creatively designed to include features that ensure carton quality is maintained as simply as possible. Intuitive technology to deliver defect-free cartons while increasing production and decreasing downtime. 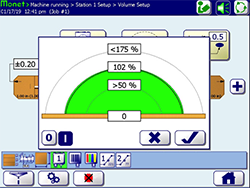 Simple gluing setup with single page access to all settings needed to apply accurate glue patterns at any speed. 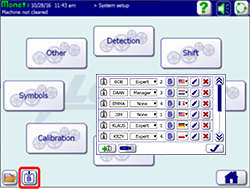 QA function such as barcode, inserts and flaps use the same easy to learn interface. 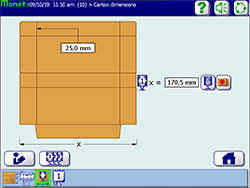 Learn carton measurements during the make-ready and automatically program where the glue starts and stops. 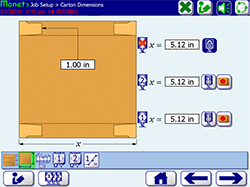 Images are dynamic and scaled to the carton on the screen. Maintain carton quality by allowing only approved fingerprints access to critical settings. Record and time stamp any system and setting changes and view the change log in iQ. Increase glue detection capabilities by monitoring for presence, placement and volume. Decrease glue usage and ensure against unnecessary squeeze out and stickers. Ensure that each gluing and quality control station is functioning. Cartons are tracked through the machine and if they haven’t been passed by every detection station, they will be rejected. 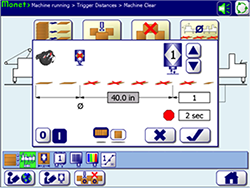 Track the defective carton to the rejection device and automatically clear the machine after a stop. Choose from separate machine or feed stop to ensure quality is maintained without impeding production.